Heavy Metal and stuff. It's two for Tuesday and the MLB All Star Game night. Watch the game if you must but jam with us as your soundtrack. night all Y'all. thanks for jamming ! 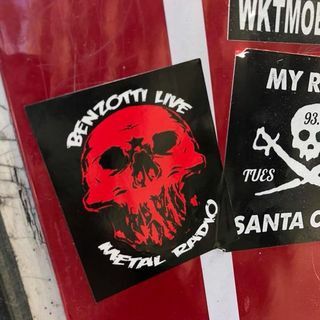 Tonight's link photo is a sticker sighting in Santa Cruz, California, USA ! Don't have them in the library. how about lashed to the slave stick? Right you are, DeRosa ! We will help you get there ! At least for a bit. When we go off , you can catch the podcast from the beginning. I have to be up 4 hours earlier tomorrow. That guitar bit right there reminds me of " Sweet child of Mine "
The good news is that you can listen to the whole thing later and hear the KTB then. And share that mofo when you ain't driving. Whoopsie, wrote that before you wrote your post. Yeah, I dig the grip Inc, stuff. Hey there , Jeff ! Where is your home base ? Hell Yeah, good old Grip, Inc. Benzotti Live was made for people like you !